Bravado! a community choir in Barrie is not your “grandmother’s choir” – they stage performances with a high energy, multi-genre presentation of popular accessible music, incorporating choreography, guest performers and comedy! One of the joys of living in Central Ontario is experiencing all four seasons to their fullest. Join Bravado! at their spring concert and celebrate the sizzle of summer, praise the universe for spring, reflect on the rustle of autumn leaves, and witness the wondrous white of winter from the comfort of Georgian Theatre. With musical genres to satisfy a variety of tastes – Bravado! seasons their spring show with spicy salsa, the salty brine of the sea, the sweetness of summer love, the bitterness of lost love, and the acerbic taste of poison and monsters. Musical flavours mixed with choreography and staging that will have you samba-ing in the street, singing in the rain, and walking on sunshine. 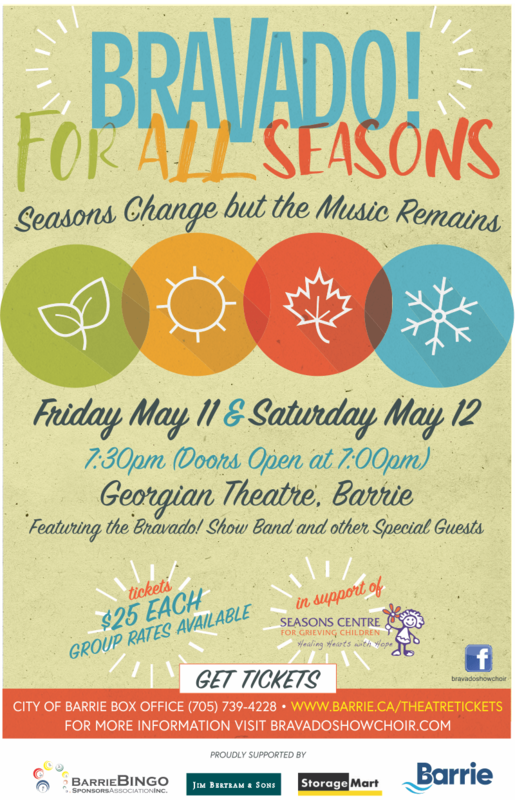 Their annual spring concert will be held on Friday, May 11 and Saturday, May 12 at Georgian Theatre in support of Seasons Centre for Grieving Children. For more information visit www.bravadoshowchoir.com. Tickets are available through choir members, the City of Barrie’s theatre box office or online at the City’s Theatre website.